The official news website of the Yanbian Korean Autonomous Prefecture in Jilin Province reported on Thursday that the Yanbian Haihua Group inked a deal in Pyongyang on September 1 and established with its counterpart a $7.83 million joint venture company. Under the deal, Haihua Group holds a 60.46 percent stake while the North Korean side owns the rest, to operate the Chongjin port’s No.3 and 4 wharves for 30 years. The ports will be capable of processing 7 million tons of cargo a year and be put into use this year. The prefecture’s public relations department and the Yanbian Haihua Group did not comment on the joint venture when contacted by the Global Times yesterday. The North Korean regime has received 6.12 million euros ($7.82 million) of rental charges for the 3,180 square-meter (34,229 square-feet) piers and a 4,000 square-meter cargo yard from the Chinese company and paid the money to fund the newly-built joint venture, the newspaper said. The Chinese company will invest a total of 13 billion won (USD $12m) on developing the port, such as building new equipment and facilities, which accounts for about 60 percent of the entire capital spent on the project. According to the daily, they have already set up a series of detailed regulations on employment management, profit distribution and the formation of a new board with a goal to raise cargo traffic to one million tons by 2015. The Yanbian group already spent 60 million yuan ($9.47 million) on manufacturing cranes and building necessary equipment, the newspaper said, and also completed work on stabilizing the 36,000-square meter grounds of the construction site. They are scheduled to finish manufacturing cranes within the year to begin a full-fledged plan for domestic and international transportation through the port. The anonymous official also revealed that North Korea has agreed to allow the Chinese company to use the railroad between Tumen and Chongjin as part of the deal. The deal, the official said, will “facilitate trade from Tumen,” and added that the Chinese company which inked it is planning to use it to fulfill shipping contracts with three other Chinese companies. The Chinese company is reportedly investing 10 million Yuan ($1.48 million approx.) in shipping cranes and other construction at Chongjin, and is having 150 freight cars produced to add to 50 already sent. It would be interesting to know if the fiasco surrounding the Xiyang contract let to a renegotiation of terms of this deal in any way: Either by altering the ownership shares, time horizon, or if greater assurances against ex post expropriation were added. Since the contract is not ever likely to be made public, we may never know. North Korea and China will develop 4 or 5 ports in the eastern coastal area of North Korea. A source in Beijing said on Sept. 17 that it was confirmed through a Chinese government official that “4 to 5 ports in the eastern coastal area of North Korea in locations such as Seon-bong, Rajin, Cheong-jin, Gim-chaek, Dan-cheon, Heung-nam and Won-san are being jointly developed by North Korean and Chinese companies.” The source added that in addition to the two ports that are being developed in Rajin and Chongjin currently, businesses in the two countries are discussing specific conditions for development in the other areas. This is the first time that this information has been confirmed by a Chinese government official. 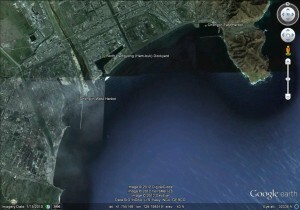 The Tanchon Port has been featured prominently in the DPRK media. Learn more about it here. You are currently browsing the archives for the Yanbian Haihua category.